Here we are at the final week of our first year in existence. What a wonderful year it's been, with so many faithful followers and dedicated participants in our challenges. We have been delighted to see so many crafters coming to love the Clean and Simple genre as much as we do! Thank you everyone for making our dream such a success. We'd like to WELCOME all the new contributors we've seen during the past few weeks, however, there seem to be quite a few people still using Word Verification... it would make commenting much simpler for us if you could please TURN IT OFF! For our challenge this week we have a SKETCH and we have a few basic ground rules. 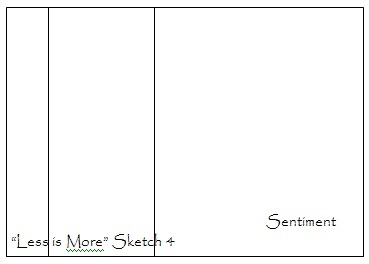 As it's a very simple sketch, we would like it to remain as is without any rotation of either the card or the vertical band. This card incorporates the 'Black Magic' technique. I began with a piece of black paper and stamped the flowers using one of the outline stamps from SU's Fast and Fabulous set, in Black Archival ink, which I then embossed with clear Embossing powder. I then overstamped these images, using the co-ordinating solid flower stamp in SU white ink, carefully aligning them with my DIY Lego Stamp positioner. When the ink was completely dry and using watercolour pencils, I then coloured the petals with a couple of shades of pink, blending the colours slightly using a water brush and adding a few highlights with a white pencil. 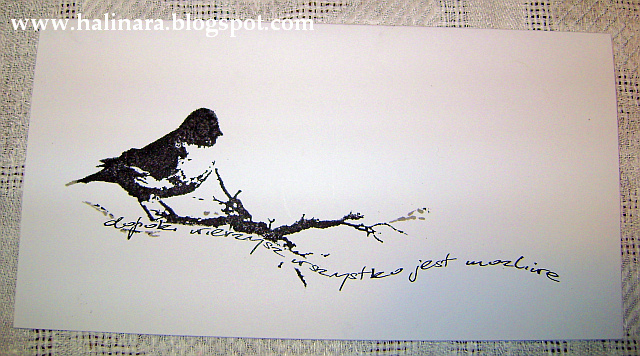 The crackle background was added using SU Craft white ink. 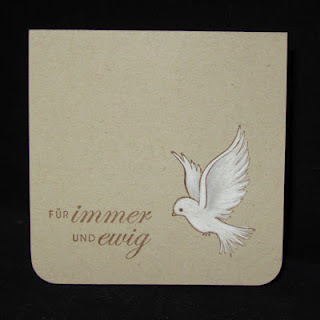 This panel was then mounted on a piece of white card and the extreme edges embossed with an embossing stylus. The sentiment is by Kaisercraft. I masked this card with Post it notes to expose just the vertical panel. 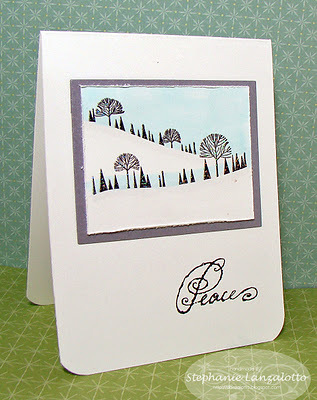 I dusted this with Iced Spruce DI using an ink duster brush and then stamped it with a background stamp from Glitz it Now plus a damask stamp from Heidi Swapp, using the same ink. The butterfly is made from a Dienamics die with lightly inked edges, glittered with Glamour Dust and embellished with a few pearls. The sentiment is from the same Kaisercraft set as the previous card. A you can see I made a boo boo and put the sentiment in the wrong place...DON'T do as I do!!! As England is on the brink of snow, I thought I'd remind us that Spring is around the corner!! For my card I used some ribbed kraft card [but turned that inwards] I made a 'DL' [double length card from a sheet of A4. I stamped the beautiful branch from the Stampin' up set 'Easter Blossoms' in Soft Suede, as I thought that it toned in well with the kraft. The blue 'sky' is Bashful Blue, also from Stampin' Up. The little dabs of pink on the blosson are with a pink watercolour pencil. 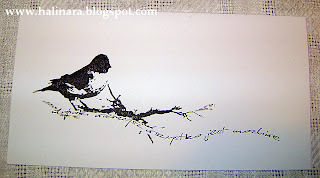 I added the little blossoms as we constantly see them lying in our garden in Spring. Another DL card. I stamped polka dots and stripes from Stampin' Up, then punched 1" circles from them and from 3 colours, added my obligatory gem! The FAB sentiment is Hobby Art. The new mini catalogue has been launched and it is packed with some exciting new goodies! Plus it is Sale-a-Bration season where you can get extra free goodies for your money. For more details, please ask me! See you tomorrow for our new challenge and the last of our first year!! You all really seemed to enjoy one layer, birds last week, as we had another bumper week. Thank you. One layer is certainly a breeze for you all now and many of you even enjoying it. Maybe it will take over the world! We also have now tipped 1200 folllowers! Amazing. For this we would like to see some kind of hole or aperture in your card! This is a stamp by Tanda very much in the style of Rennie Mackintosh. The circle element seemed perfect for making an aperture and as luck would have it, one of my circular Nesties was the perfect size. Here is the technique I used in order to cut out just part of the circle and leave the lady's image intact. Cut around the edge of the image within the circle with a craft knife, continuing just past the edge of the circle. Place the die in position, under the cut out section of the image. 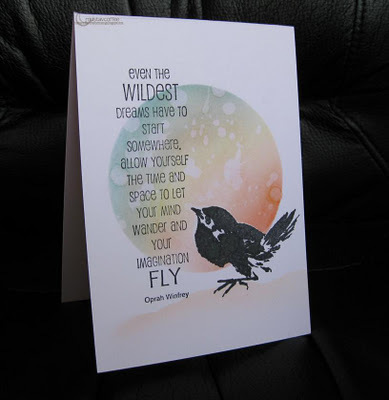 Run the card through your die cutting machine. The whole image was cut out with a rectangular Nestie adjusted to fit the frame of the image, as in a previous tutorial. The image was coloured with Distress inks and the pink sections glittered with Glamour Dust. This one has a die cut, rectangular aperture, which has been decorated with a Martha Stewart flower border and additional, matching, Woodware punched flowers. 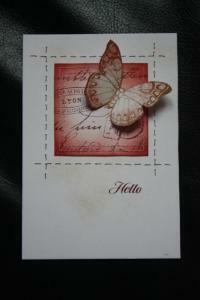 The butterflies are from Dienamics and Marianne Creatables, again with a little added Glamour Dust. The computer generated sentiment is in Passions Conflict ROB font and mounted on an oval Nestie diecut. There are a few more aperture cards on my personal blog, one using no dies to make the aperture!. We look forward to see your wonderful creations. Better late than never... life has been hectic this week, but finally here are our showcase cards from the fabulous submissions for our Purple challenge! As ever it was really difficult to choose from amongst all the beautiful designs, but I'm sure you'll agree that all of these are worthy of our ShowCASe! Thank you all, do please take the Special ShowCAse badge from the page above to display on your blog! As you know we had two sponsors, therefore two lucky winners! both of which are much appreciated by all. If you could contact us we will arrange for you to receive your prize. The camp seemed pretty divided last week, re like or dislike purple, but there were some stunning submissions. Remember to add NO additional layers and to keep embellishments to a minimum. Uber simple... a chicken (did I ever say how much I like chickens?) from Artemio, gently coloured with Copics and with the addition of a sentiment from Hero Arts. Penny Black this time and two gorgeous ducks! 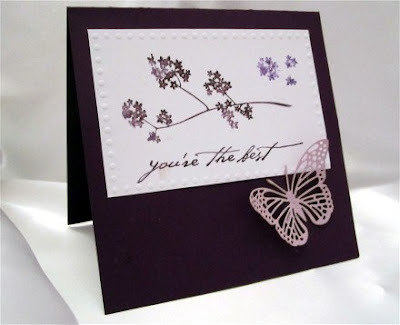 These have such super expressions and I think this Stampin' Up sentiment is just right! The image was stamped and masked, before the circle was inked through another mask, in Scattered Straw and Wild Honey DI, applied with Ink Duster brushes. The images were then coloured with Copics. I love it's quirkiness! It is such a fun set. 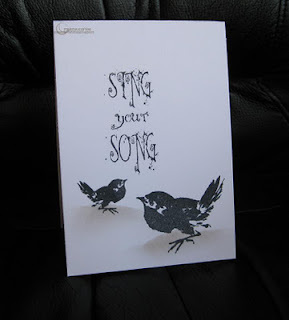 I used my Stamp-ma-jig to get the placement of the birds correct. The sentiment is from a retired set as is the Pink colour. The other 2 colours are Pear Pizazz and Black. The branch is from another set called Hopeful Thoughts. I used the markers to ink the stamp, so I could colour the stem in black, the leaves green and the flowers pink. I chose to add a little interest with the punched flower heads and a few little trails of liquid pearls. Even more white space on this one! Hopefully you can see it, taking the photo was pants! The birgs are stamped in Tempting Turquiose, Pink Passion [retired] and Rich Razzlebury. We do hope you enjoy this week as much as your passion for purple! There are more examples on our personal blogs... do take a look! Once more we had a fabulous selection of entries to drool over and as ever the decision of which ones to showcase was terribly difficult, but these really caught our eyes! Thank you so much ladies, do please take the Showcase badge from the page above and display on your blog for all to see! Don't forget to check back on Saturday for our new challenge!